I really admire people who can work with their hands and make things. I tried. In high school shop, I wanted to make a birdhouse. It looked more like a trapezoid than a square. I got a ‘D’ on that project. In any project where I worked with my hands, a lack of knowledge and experience may have been part of the problem, but my bigger problem was a lack of patience. To greater or lesser degree, most of us are impatient about something. Someone once said, “Patience is a virtue, possess it if you can. It is seldom found in a woman, and never in a man.” Excusing the sexism, I like the quote, because it acknowledges that this scarcity of patience is a truism, not only for me, but for many people. There was a Christian theologian in the second century named Tertullian who said that the people of Nazareth should have known Jesus was God because of Jesus’ patience. That’s a way of saying that patience is a characteristic of God himself. God’s patience, his slowness to anger, is good news for us, because we need time to discover when we are on the wrong road – when we do not include the Lord in our lives, when we no longer take time for worship, when we no longer pray or listen to his word. We need time to be convinced of our need for God’s forgiveness and God’s help in our lives. We need time to grow in the Spirit and mature in the faith. We cannot become the people God calls us to be overnight, and so thankfully God is slow to anger. The Bible translations now all use “slow to anger,” a phrase we moderns can understand. God just isn’t the angry type, we say. We don’t imagine God getting all worked up over things. And so we call him “slow to anger.” But that older word, long-suffering, brings another idea to mind – that God puts up with a lot of misbehavior, a lot of sin, and lot of downright evil from humankind. If he did not, if we were forced to face the God’s just punishment for every deed, we’d be in big trouble. Long-suffering is a way of saying that those who are patient will suffer. I got into trouble a few times as a teenager. Although my parents were disappointed, they continued to trya dn help me, to pray for me, and to point me in the right way. They didn’t give up on me. But in the meantime they suffered a lot of agony. But they did so out of love. To really love someone means that you may be in for long bouts of suffering. And the Bible tells us, that God does that for us. Our Old Testament reading from Isaiah tells us that God suffers disappointment with the people, whom he calls his vineyard. They have forgotten God; they have disobeyed; they have sinned. God has suffered long. God sent leaders; God sent prophets. God had been patient for over 300 years. And so, now, God decides to discipline the people. Perhaps they will recognize their sinful ways and return to God. But I wonder who suffers more – the people, who experience the invasion of a foreign army, or God, who has to watch his people suffer. Let’s be clear on this: God has not given up on the people; God has not forgotten the people. God may feel disappointment, God may even discipline his people, but his love is still strong, they are still his people. If you read on in the prophet Isaiah, you will hear of God’s forgiveness and restoration. We hear these words beginning in Isaiah chapter 40: “Comfort, comfort my people, says your God.” God will take the people back. God will restore the land. The failure of the people is not the last word. God has not given up. God will give second, third, and fourth chances. And if you read on in the Bible, you come to the New Testament and the story of God sending his Son. Today’s reading from Mark 12 is a parable Jesus told about a landowner who has a vineyard that he leased to tenant farmers. When the landowner sends his servants to collect the rent, the tenants not only refuse to pay, they abuse the servants, killing one of them. Instead of taking stronger steps against the tenants, however, the owner sends more servants, who are similarly mistreated. Finally he sends his son, thinking that the tenants will respect him, but instead, the tenants kill the son. Jesus then says that the owner will come, destroy the tenants, and lease the vineyard to others. It’s easy to see that this parable functions as an allegory: The vineyard is Israel, the landowner is God, the tenants are the corrupt religious leaders, the servants are the prophets, and the owner’s son is Jesus himself. This was a parable of judgment upon those religious leaders who in Jesus’ day were leading the nation spiritually astray. But it shows that even with them, God had patience. He sent prophets and when they were not listened to, he sent more. For over 1,000 years, as recorded in the Old Testament of the Bible, God sent prophets. And then, when the time was fulfilled, God finally sent even his Son. The point about the patience of God is not that we have unlimited time to turn to God. Rather it is that God’s love for us is so intense that he functions toward us not in anger, but with patience. He withholds judgment so that we might have time to come around. The entire story of the Bible is, in one sense, summed up in the idea of God’s long-suffering patience, for it is an expression of how God will not let us go, but continues to love us and call us back. 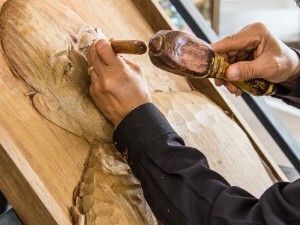 I am impressed with people who can work with their hands: people who have a woodworking skill that can produce amazing pieces of furniture and art and knickknacks and carvings from a pile of wood; people who can produce amazing quilts or embroidery with a bunch of material and a needle and thread. I have always marveled at the patience of people who create these amazing things with their hands. Well, we have an amazing God who also creates. God is patient and long suffering, and does some incredible work. Today, we give thanks for the ministry of women in St. John Lutheran Church – council leaders, parents, quilters, workers in the mission of our church, teachers, musicians … home communion visitors – faithful servants of God. These bold women are a testimony to the faithfulness of God, who does not give up on us, but is working in our lives, shaping us as his people. Think of God as a patient seamstress, or a patient quilter, or a patient woodworker. Instead of an impatient, angry God, ready to give up on us when things don’t work out his way, he is the one who is patiently working on us, forming us into the people we were created to be. Let us give thanks to God for his long suffering patience and his amazing love.